"As people in favor of the low-carb diet will jump on these results, I really try to say that this is limited evidence," Dr. Alain J. Nordmann warned regarding his new study. Hoo boy, can you tell this one's gonna be a doozy?! This MedPage Today article is about a new study that shows nearly identical weight loss for people on low-fat and low-carb diets, but there is concern about the low-carb group elevating their LDL cholesterol levels. Researchers led by Dr. Nordmann from University Hospital in Basel, Switzerland conducted five controlled clinical trials on nearly 450 overweight study participants over a one-year time period, with half of them placed on a low-fat diet and the other half were on a low-carb diet. Dr. Nordmann found that the low-carb diet group had lost more weight than the low-fat diet group after six months, but the weight loss was almost even after one year. Blood pressure was also nearly identical, the researchers noted. However, they discovered that there was an increase in the total cholesterol and low-density lipoprotein (LDL "bad") cholesterol for the group following a low-carb diet. They added that the rise in LDL cholesterol for the low-carb diet group completely negated any increase in HDL "good" cholesterol and decreases in triglyceride levels. This study was published in the Archives of Internal Medicine on Monday. Okay, so the low-carb diet performed JUST AS WELL as the low-fat diet in the study. Is this not GREAT news?! We've been told that low-carb is not as effective because all you lose is "water weight," but clearly that is not the case. The low-fat recommendation can no longer be held in high esteem for bringing about the most weight loss anymore. Do you think doctors are gonna start recommending low-carb living all of a sudden, though? Not likely. Here's why. They're still worried about the supposed negative effect it has on cholesterol levels. We'll get into that in a moment. For the purposes of this study, "low-carb" was defined as 60g of carbohydrates per day while "low-fat" was 30% of energy intake as fat. I'm sure both sides will balk at these levels of carbs and fat respectively. Most genuinely "low-carb" diets start off at 20g of carbohydrates and rise to varying rates between 20-60g daily during weight loss. It all depends on the individual and subjecting some people to as many as 60g carbs per day may not have been the ideal way to help them maximize their weight reduction. In other words, some of those in the "low-carb" group COULD have lost more weight if they were allowed to decrease their carb intake to a level where they would still lose weight. And, to be fair, most people who follow a "low-fat" diet as recommended by low-fat guru Dr. Dean Ornish try to keep their fat intake down to about 20-25% of their total caloric intake. Eating more fat than that, as we have seen from low-fat supporters in the past few days, is not considered "low-fat" to them. Nevertheless, the study results are intriguing even if the conclusions are just a little bit off. You see, this business about low-carb diets causing total cholesterol and LDL cholesterol to go up is frankly irrelevant in the face of the remarkable increases seen in HDL cholesterol and drops in triglycerides on a low-carb diet. After six months, the researchers found the low-carb diet participants saw their HDLs go up an average of 4.6 mg/dL and their triglycerides go down 22.1 mg/dL, with slight increases in LDL cholesterol. On the flip side, the low-fat diets saw their LDL cholesterol fall an average of 5.4 mg/dL and the total cholesterol drop an average of 10.1 mg/dL. So which is better? How about if we ask University of Connecticut, Storrs assistant professor Dr. Jeff Volek for the answer to that question. 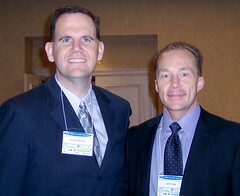 I met Dr. Volek during the Nutritional & Metabolic Aspects of Carbohydrate Restriction conference in Brooklyn, NY in January. He presented the findings of a recent research study of his own regarding the effect of a very high-fat, low-carb diet on cholesterol compared with a standard low-fat diet. In his 12-week study, Dr. Volek used study participants who had moderately high triglycerides (over 150) and relatively normal HDL levels (below 50). Half of the participants were placed on a low-fat diet consisting of less than 30 percent of total caloric intake from fat (as is the standard with the American Heart Association) and the other half consumed a low-carb diet with an extraordinarily-high 85 percent fat intake to test the fat tolerance of the study participants. What were the results of this study after just three months? The low-carb diet group lost TWICE as much weight as the low-fat diet group while total cholesterol and LDL cholesterol levels decreased equally among both groups. But the most compelling and exciting results of this study is what happened to the HDL and triglycerides. The HDL rose by 8 percent in the male participants and 17 percent in the female participants in the low-carb diet group. The low-fat diet group, on the other hand, actually saw their HDL "good" cholesterol numbers FALL by 1 percent! As for the triglyceride numbers, the low-carb diet group decreased their triglycerides by a whopping 51 percent compared with a mere 15 percent drop by the low-fat diet group. This was a SIGNIFICANT difference between the two groups in the study. Dr. Volek pointed out that the reason this study is noteworthy is because it underlines the importance of how a low-carb diet makes the triglyceride/HDL ratio so much better than a low-fat diet. He said this ratio is the real key when looking at cholesterol numbers. For far too long, doctors have exclaimed how important it is to keep your total cholesterol number below 200, right? Isn't that what all the hoopla over statin drugs is about? "Aim lower," one of the obnoxious ads for cholesterol-lowering medicine blares out to us on our television sets, but why? If your triglyceride/HDL ratio is incredible, then you don't need to worry about how high your total cholesterol is. You just don't. My most recent blood work revealed that my triglycerides are 57 and my HDL is 71. That makes my triglyceride/HDL ratio a miniscule 0.83. My doctor has even said with a ratio that good (it was A LOT BETTER than his! ), I don't need to worry that my total cholesterol being 201. And that's the message of the study conducted by Dr. Volek, too. Just like on the issue of fat, Americans have been scared half to death about the supposed dangers of what they perceive as high cholesterol numbers. But they've been duped yet again! We need to learn from the work of people like Dr. Volek and realize there are much more important numbers to look at (trigylcerides and HDL cholesterol) than the total cholesterol and LDL cholesterol. Unfortunately, this fact has been completely overlooked by Dr. Nordemann. "Because no trials have yet examined the risk of heart attack or death in people on low-carbohydrate diets, it's unclear whether the beneficial effects that low-carbohydrate diets appear to have on HDL and triglyceride levels cancel out their apparent negative effects on overall and LDL cholesterol levels," Dr. Nordmann said. Why is that, Dr. Nordemann? Why are the positive effects on HDL and triglyceride levels negated? You can't just overlook these improvements and write them off as irrelevant for the low-carb dieters! The results of your study may not be what you want them to be, but they are what they are. As for weight loss, Dr. Nordemann said the "not clinically relevant" differences in weight reduction make it impossible for him to recommend a low-fat diet over the long-term. "We believe there is still insufficient evidence to make recommendations for or against the use of low-carbohydrate diets to induce weight loss, especially for durations longer than six months," he exclaimed. "Such diets currently cannot be recommended for prevention of cardiovascular disease." Well, we'll see about that won't we, Dr. Nordemann?! I've been livin' la vida low-carb for over two years (AND I'VE LIVED TO TELL ABOUT IT, TOO!) with nothing but positive news to share about my weight and health. This garbage science from people like Dr. Nordemann just makes me want to hurl. Thank God for brave and bold researchers like Dr. Volek who are so willing to just share the facts about how a low-carb diet is making a real difference in the lives of the people who do them. You can e-mail Dr. Alain J. Nordmann about his study at dok20052@healthindex.ch as well as Dr. Jeff Volek about his study at jeff.volek@uconn.edu. Hmmm. My total cholesterol went up 15 points to 166, but my LDL went down 14 points to 84, and my HDL went up 29 points to 74. My triglicerides were already very low and remained there (39). Hah! This entire cholesterol thing is just another baseless, totally unscientific hyperbole. In over 4 decades worth of studies not a single one of them was able to link high cholesterol with increased risk for CHD or higher overall mortality rates. The fact is that tightly-controlled long-term studies have shown that people with LOWER overall cholesterol tend to live SHORTER lives, whereas individuals with higher total cholesterol and healthy ratios live LONGER lives. As for the tired, lame argument that there have not been enough long-term studies to determine the long-term effects of low-carb diets: that's even more BS. Firstly, there have been dozens of long-term studies (all favorable) and secondly, while consuming traditional high-fat, low-carb diets humanity survived, evolved, and thrived. That's a FEW HUNDRED THOUSAND years, ladies and gentlemen of the media! Or is that "too short" too? LOL! I commend your resolve to avoid statins. I'm myself faced with a similar conundrum. My calculated LDL is up to 282 from 164 nine months ago. But in the same time, my HDL is up from 38 to 50; and my triglycerides are down from 207 to 121. In the meantime, I'm feeling much better and have lost 50 lbs. My blood sugars are better--A1C down from 6.0% to 5.5%) meaning I am no longer "pre-diabetic". My blood pressure is lower from borderline hypertension to normal (when not at the doctor's I will test at optimal levels with in-store blood pressure machines and my home machine). So all my risk factors for a coronary event are way down except LDL (which is common for low carbers) and now my doctor wants to put me on statins? The latest research (in detail at Peter Attia's blog) suggests that elevated LDL-P is more indicative of risk than LDL-C. Those who die of heart attack often have normal LDL but elevated LDL-P (number of LDL particles). Thus, the LDL-C numbers are not important. Indeed, the person at lowest risk has high LDL-C but very low LDL-P. Without an ApoB test, a person may determine their likely risk of high LDL-P with the TG/HDL ratio. My ratio is at about 2, which means that my LDL-C is probably not a concern. That's fantastic. Kudos. And thank you for your recommendation. I will have a look at the reviews at Amazon to begin with and perhaps order it later. I was appalled by my doctors reaction when I offered to copy for her some pages out of Volek and Phinney, Art and Science of Low Carbohydrate Living. Her reaction, in my view, was recalcitrant and unprofessional. For crying out loud, doctors need to keep up with the research. But instead, their advice is too iatrogenic, killing their patients, as they treat patients using numbers which for them remain a black box about whose contents they have no clue. I argued with my doctor and basically said to her she didn't know enough about my diet to be able to say what my LDL numbers should be and that I was going to consult my resources and photocopy them for her. But she's following ministry guidelines for her profession (here in Ontario), so it is extremely unlikely that she will actually be open minded enough to shift her think. Very sad, as the medical profession kills people.